These Quinoa Fajita Burritos are one of our favorite meals! 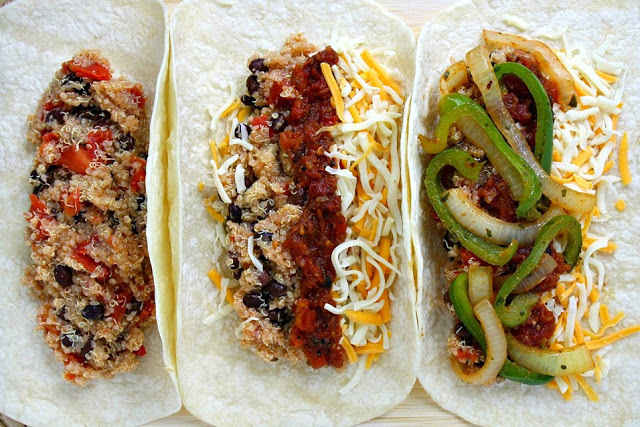 Flavorful fajita veggies are combined with taco seasoned quinoa, beans, and tomatoes all wrapped up in a delicious tortilla package. Easy, vegan, and freezer-friendly! I love these so much! They’re such a versatile, awesome week night meal and I love that it makes extras for quick and easy leftovers (or freezing!) This particular time, I had the intention of freezing them all, but of course… temptation struck and one less made the journey to the freezer 😉 You could easily leave out the tortillas and make these into rockstar burrito bowls piled high with all your favorite toppings. Hope you enjoy as much as we do! PS – come join The Garden Grazer on Instagram 🍓 and share a pic if you make these! I love seeing your recreations. 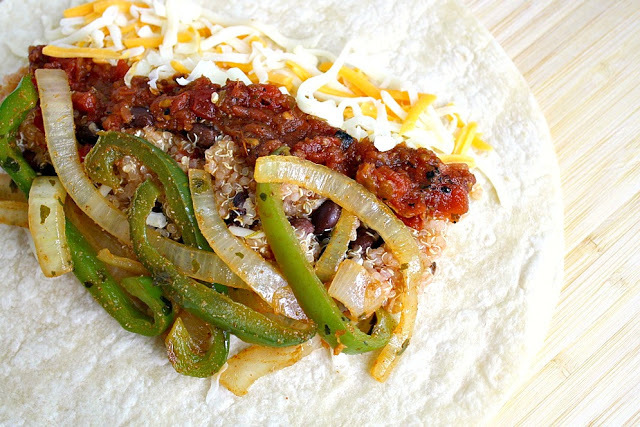 Flavorful fajita veggies are combined with taco seasoned quinoa, beans, and tomatoes all wrapped up in a delicious tortilla package. Easy, vegan, and freezer-friendly! Avocado/guacamole, cilantro, lettuce, hot sauce, etc. While quinoa is cooking, thinly slice onion and bell pepper. When quinoa is cooked, add it to a large bowl. Then add black beans (rinsed and drained), diced tomatoes (drained of excess juice), and 1 Tbsp. taco seasoning. Stir well to combine. Assemble the burritos: spoon the quinoa mixture, onion/pepper, cheese, and salsa (or other toppings of choice) down the middle of your tortillas. Roll up, tucking in both sides. If you like a crispier tortilla/grilled burrito, toss it on a grill pan for a few minutes on each side before serving. We love this! For gluten-free: use GF tortillas (or corn tortillas). 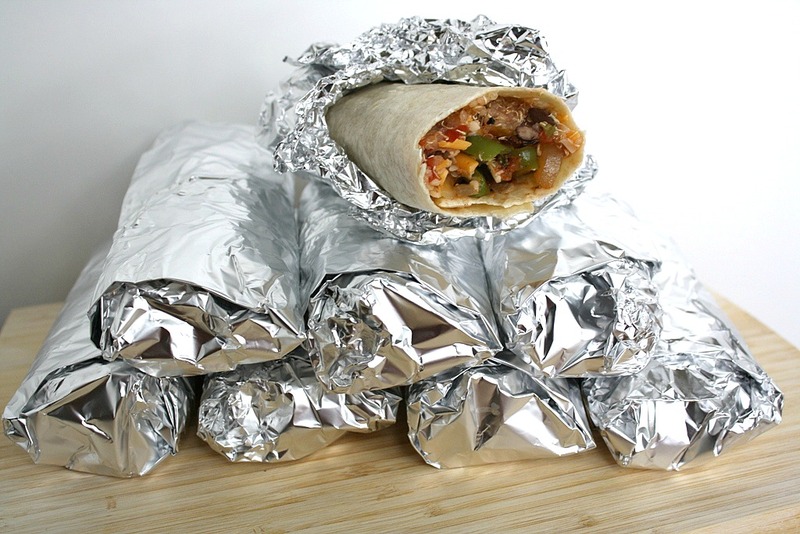 To freeze: I tightly wrap burritos individually in foil, then place them all in a sealed freezer-friendly container. YUM Kaitlin…you'll be all set for when baby comes! Those look great! I always have homemade burritos in the freezer for my three year old, but never any for me! I think I will definitely give these a try! These look delicious, and they ARE delicious! I just made them last night and I wish I had more leftover – alas we couldn't stop eating them so they're almost gone 🙂 Great recipes here – keep 'em coming! Hi again! So great to hear you tried these and like them! Isn't it awesome having yummy, healthy meals in the freezer ready to go? Would love to hear what else you try. 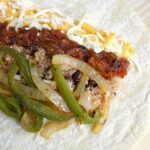 Enjoy your easy freezer burritos over the next couple weeks! I made this for dinner tonight…I doubled the veggies, and thank goodness I did…my family couldn't get enough! Thank you for another awesome recipe! Hi Stephie! So glad you tried these and liked them! One meal I can never get enough of either 😉 Thanks for letting me know! Do you need to defrost prior to baking? About how many burritos will one batch make? I've heard it's pretty straightforward and easy to use. Hope that helps!! Hi Kaitlin! How do you get the tortilla not to stick to the tin foil? Hi Liaht! Ahhh, oh no!! That's no good – sorry to hear they stuck! I've haven't had that issue, but to prevent it in the future, you can instead wrap the burritos individually in plastic wrap and then place them all in a large ziploc freezer bag 🙂 Have a great week! It's a good thing these are so delicious! I just made about twenty of them 🙂 Thanks for a healthy, inexpensive, and easy freezer meal! I was wondering if you use real cheese, or Vegan Cheese because I'm sure you said you were a Vegan? Maybe I got that bit wrong, or I am confused. Hi Nancye! Yep – we're vegan and use vegan cheese. (However I was vegetarian when I started the blog so maybe that was the confusing part) 🙂 I admit I don't buy "cheese" very often, but there are some great dairy-free products out there now it's fun to try them out! Not a fan of quinoa so I used Jasmine brown rice. I also skipped the canned tomatoes, not a fan of them either. I crisped them in the pan then topped them with a little sour cream and green onions. They were delicious. Very versatile recipe. Thank you for posting.